I am taking my time to read Elizabeth Bowen’s The Heat of the Day, because it’s a book to savour. 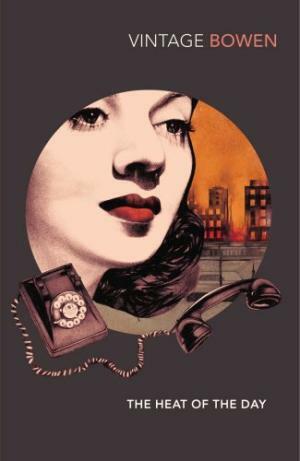 First published in 1948, this novel of London during the Blitz is listed in 1001 Books You Must Read Before You Die because it renders the atmosphere so well, but it’s also a masterpiece of character. It had been clear, since Roderick was a child, that friendship with him would have to be one-sided. Not minding if he saw a person or not had been as far, apparently, as he would ever go; though he showed a well-mannered pleasure, wrongly read as response, in efforts to entertain or attack him. Stella had seen, if never taken to heart, the folly of hopeful comments on interests he did seem inclined to form. If he was what Harrison claimed to be, without vanity, that only made him more passive in relations with other people. If his willingness to be told a quite new story wore the deceptive guise of a new friendship, the deceived one, rather than Roderick was to blame. He coupled a liking for, a curiosity as to, what was going on with a reluctance that it should involve him – more, a positive disbelief that it ever could. In general, he was in favour of what was happening, but preferred what had happened as being more complete: so far, his heart had never moved from its place, for it had felt no pull from a moving thing. His attention, as an entirety, was yet perhaps to be daunting, to be reckoned with: up to now it had never been wholly given. His motives were too direct to be called ulterior; he liked going out to tea with families who had a brook through their garden, hypothetical snakes in their uncut grass, collections of any kind in cabinets, a haunted room, a model railway, a funny uncle, a desk with a secret drawer. He attached himself to the children of such families in a flattering, obstinate, reserved way – you could not, somehow, accuse him of cupboard love. Modernism has had its day… nobody writes like this any more. The maxim is, ‘show, don’t tell’, and an editor would take the red pen to those staccato insertions which break up the flow of the writing. And yet, something remarkable is here in this excerpt – an insight into one of the most difficult ‘types’ to convey in words. People sometimes dismiss this kind of British diffidence as disdain, and there could be a temptation to sneer at Roderick as the kind of man who ‘can’t commit’ – but he was once a child fond of secret drawers and hypothetical snakes. There’s something very appealing about that.